Sometimes I will make granola bars, but sometimes I make sprinkly granola for us to eat out of hand, in a bowl with milk, over yogurt, etc. Today I’ll share the recipe because Kristi asked me over on Google Plus. (You can catch up with me on Google + by clicking the g+ in the right hand sidebar or here.) Granola can be customized to fit your taste. If you like walnuts but not pecans, or craisins but not coconut or dates, then use use what you like and leave out the stuff you don’t like! 2. Add oil. Using the same measuring cup, add honey. This helps you get every last drop of that precious honey in the mixing bowl. Add vanilla. Mix thoroughly. 3. Spread in pans and bake. Stir every 10 minutes for about 40 minutes. The granola will be hot and light golden brown. It will become crispy once cool. 4. Add dried fruit as desired. Store in airtight container. 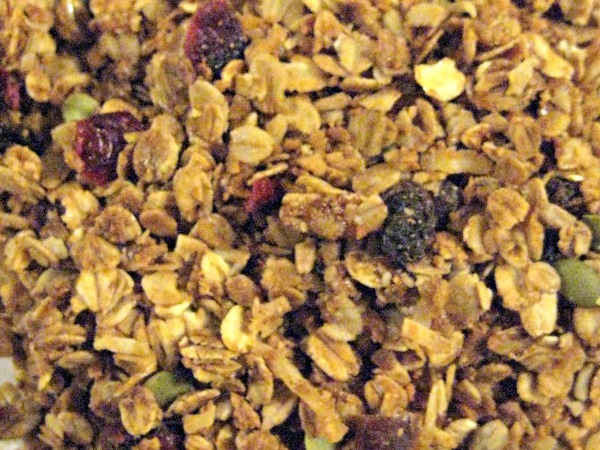 This entry was posted in food and tagged granola, recipe. Bookmark the permalink.